Highland Guides are pleased to offer guided and / or organised tough 1 and 2 day challenges in the UK Mountains. Whether you are off to Everest and want to test and improve your fitness or need assistance achieving a long held ambition to do a big mountain traverse we have something for you. Perhaps you are an unusually fit and motivated corporate group wanting something a lot tougher than the average outdoor multi-activity sessions. We don’t offer those but read on for inspiration about some highly ‘character building’ days in the UK mountains. But beware – most of the days described below are physically and mentally demanding and way beyond folk without a good level of fitness and a lot of determination. There are clearly many more classic mountain challenges throughout the UK and with a little imagination and a lot of pouring over maps something can be planned to suit your needs. There are also some creative rock climbing ‘enchainments’ to be done – so please contact us for further inspiration or with your own ideas. Conveniently starting and finishing at the famous Clachaig Inn a pint of the local Heather Ale will certainly be going to your head after this ‘wee outing’. At 19 miles and 3800m of ascent this is statistically not one of the longest outings mentioned here but it is clearly a tough day over constantly broken, and rocky highland ground and the finish along the famous scrambling traverse of the Aonach Eagach requires a cool head at the end of a long day. Highland Guides associate Nick Carter made the second successful winter traverse of this substantial round of 18 Lochaber Munro’s in a continuous push of 29 hours 23 minutes in January 2001. That time has been improved on now but the winter round still awaits a 24 hour completion – perhaps it will get one this coming winter. Any takers? It is more often, although still not very frequently, completed in summer with the traditional approach aiming to finish the round in one sub 24 hour push. Brace yourself there is nothing like those luxurious New York Flights or those breezy mountain tours. Even in summer this is still good going considering the 40 miles and 6300m of ascent over some very rough terrain in the dark. However the effort is well worth it as this is a classic mountain journey incorporating the Mamores, Grey Corries, Aonachs and Ben Nevis before returning to the traditional starting point of the Youth Hostel in Glen Nevis. An easier version of this route which halves both distance and height gain (but is still a long day on the hill) aims to traverse all the Munro summits and tops of the Mamores. 21 miles and about 3000m of ascent. Although rather out of character with most of the other routes mentioned here, both due to its reduced distance and significantly increased technical difficulty, this traverse has to be included as it is clearly the finest single mountaineering outing in the UK. The straight 8 mile distance and 7000 feet of ascent should not induce any complacency as this is almost constantly exposed scrambling ground with various short sections of rock climbing and abseil descents. Whether it’s done in a long, tiring, day or, more romantically, with a bivvi halfway along the ridge it is an absolute must for those suitably prepared and wanting one of the best experiences the British Hills have to offer. Also starting from Glen Nevis Youth Hostel this route does not also finish there but a meaty 83 miles away at Glen More Youth Hostel after completing the Scottish 4000 foot peaks of Lochaber and the Cairngorms. With just over 5000m feet of ascent this is another outing that’s not for the faint hearted! Although, remarkably, this traverse has been done in Just under 22 hours (by Martin Stone in 1986) it is more normal to attempt it over 2, still both large, days on the hill. The two individual sections both break down neatly into highly satisfying days in their own right and can be linked on the road by bike, or even by car! In October 05 our attempt on the complete traverse was called off in very wet and windy autumn weather but a good day was had nonetheless traversing Aonach Mor (which is actually only 3999ft but included anyway) and Aonach Beag followed by the excellent Carn Mor Dearg Arete and over Ben Nevis. At just 6.6 miles and with only 910m of ascent this is by far the shortest day described here. It is included however in recognition of it’s superb mountaineering feel and views across the rest of Snowdonia. It is arguably the best classic mountain day south of the Scottish border and if you haven’t done it consider it a must whatever the season, although it is generally worth waiting for a calm, dry day. In scrambling terms the difficulties are not great although the route does involve some impressively exposed narrow ridge walking and those of a nervous disposition should arrange a day with Highland Guides on similar but less exposed terrain prior to attempting the Horseshoe (for example combine the Snowdon and Bochlwyd Horseshoes for a brilliant weekend of easy mountain scrambling). For those who want to spice the traverse up a little we can provide more difficult direct starts and finishes creating a superbly sustained day on the rock – see our summer mountaineering section or contact us for more details. Flying Buttress on Dinas Cromlech, Grooved Arête on the E. Face of Tryfan and Hope on the Idwal Slabs, Ogwen. All brilliant multi-pitch V.Diffs spread across the faces and cwms of the Glyderau….so why not do them all in a day? Nearly 500m of classic rock with several miles of rocky and heathery walking in between – great alpine preparation or just a highly memorable day on the hills and crags of Snowdonia. This is the classic long distance mountain round of North Wales traversing the 15 principal summits of Snowdon, the Glyders and Carneddau. I have done it myself in a day and with clients over 2 days and both are fairly logical. On a traverse with a Plas-y-Brenin group the weather on the first day was terrible and the clients made a seriously spirited attempt to get over the Snowdon group, Elidir Fawr and Y Garn. The approaching dusk and continuous rain had taken its toll however and descending the Devils staircase to Idwal Cottage proved too tempting for all of us! Next day we had windy but clear and atmospheric lighting for the traverse of the Carneddau out to Aber Falls and were all fairly satisfied despite missing Glyders Fach, Fawr and Tryfan on day 1. This is an elegant round, logical in line and with some great terrain (including the best bits of the route below) but at 37 miles and with several thousand metres of ascent it is not for the faint hearted or weak legged. Whether it’s done over 2 days or in a tough, single continuous push it will provide a mountain challenge to remember. This is a classic long hill walk through the high peaks of the Yorkshire Dales and regular good tough, 23.5 mile, hill walking challenge for those training for Mont Blanc. 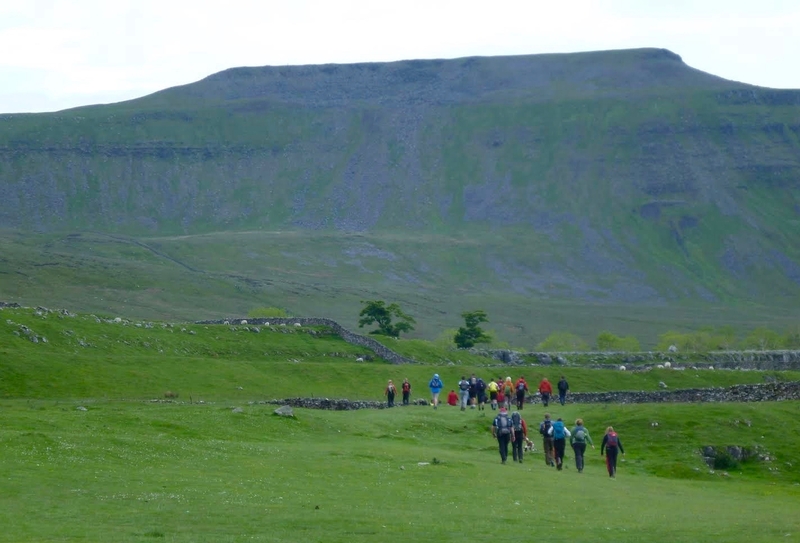 The route traverses the trio of summits Pen-y-Ghent (694m), Whernside (736m) and Ingleborough (723m). Although this is not as tough as some of the other walks described here it has over 1500m of ascent and a variety of terrains. In mist the route finding is not always straight forward and although traditionally you ‘should’ do it in less than 12 hours many teams take a lot more. This is the route of the classic High Peak Marathon following the high moorland terrain of the Derwent Watershed. It is a 42 mile round trip from Edale through some fairly featureless moors and bogs and across the aptly named ‘Bleaklow’ Plateau. It is just as much a test of navigation, determination and a stubborn willingness to keep going after 35 miles with blisters as it is speed and fitness. Although leading race times are around 9 hours a respectable walking time would be more like 14 hours. This is how long it took me to walk it with my dad in 1996….and I for one was rather stiff the next morning! This alternative Peak district route is about half as long as the Derwent Watershed. At 21 miles and 1400m of ascent it’s still no pushover although it is obviously a ‘path’ compared to some of the other routes mentioned here. Starting in Hope (literally and metaphorically!) the route takes in some of the finest bits of the Dark Peak including Lose Hill, Mam Tor, Edale Cross, the Southern edges of Kinder and Win Hill before returning to the fine pub at the starting point. It’s a good day on the hill – despite the peat bogs of Kinder, and highly recommended as an early Mountain Challenge. Around 7-10 hours walking. The archetypal hard English fell running challenge over 72 miles and 8700m of ascent. To make the traverse in 24 hours is one of the most demanding set mountain challenges around. As such it is mainly included for interest only here as most folk with the fitness, navigational ability and determination to stand any chance of doing it will probably not need our help. However please read our article on one successful completion ‘A close run thing!’ and get in touch should you have any enquiries about this super tough UK mountain challenge.